Kevin Johnson is an iron man. As the owner and chief blacksmith of The Iron Studio in Knoxville, Tennessee, bending metal is in his blood, and he’s made his living (and a notable reputation) doing what he’s always wanted to do. Kevin’s skills are self-taught. He was introduced to the craft by his father who, when he wasn’t engineering stealth bombers for Lockheed, would show Kevin the basics of wrought iron in their backyard machine shop. 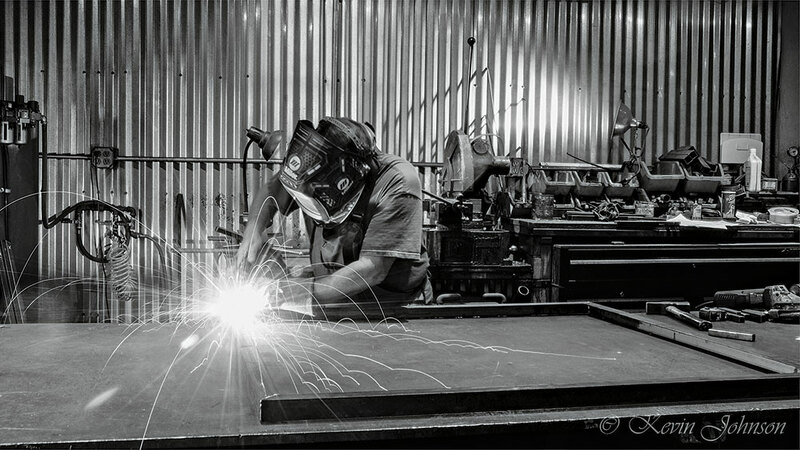 “I’ve never worked in a welding shop other than my own,” he says. Together, he and his father forged fences for the family property, and soon neighbors and friends wanted work done on their own fencing. “Have Kevin do it,” his father would say. Now, Kevin and The Iron Studio handle all sorts of custom projects, from specialty railings to vent hoods; wine cellar doors to one-of-a-kind chandeliers. It’s important to Kevin that, in addition to matching a client’s vision, a project also matches its environment. A typical project begins with scouting the location and preparing preliminary sketches. Then Kevin presents these ideas to the client, using facial expressions as his main barometer of success. After the thumbs up, it’s back to the literal drawing board and from there, the forge. While everything made at The Iron Studio is custom designed, sometimes the requests aren’t so ordinary. He’s created an iron bustier, nicknamed Jezebel, which has made the rounds on the competition circuit, even winning first place at the SOFA (Sculpture Objects Functional Art and Design) competition. This design process, and personally working with each customer to get it just right, is Kevin’s favorite part of the job. He’s a people-person and making someone’s vision a reality has always been the fulfilling part for him. Before he worked at the anvil, Kevin was an engineer and salesman for IBM. They sent him around the world and he “learned how everything from Barbies to Band-Aids work.” But, being an iron man at heart, he used these trips to tour the great iron works of the world. Ironically, his favorite piece is that of Samuel Yellen, the grandfather of American blacksmithing, who shaped the gates of the National Cathedral in Washington, D.C. 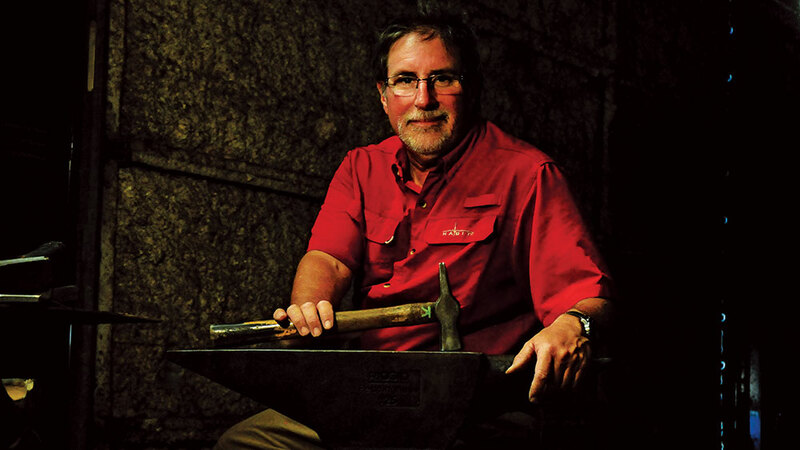 When asked about the future of blacksmithing in this technology-driven age, Kevin referenced the trade’s history as evidence for its survival. “In the Dark Ages and the Roman era before, blacksmiths were fought over,” he says. “Everybody wanted the best ironworker.” Kevin believes the same logic exists today — than now more than ever, people appreciate quality, handmade crafts. Kevin is such a believer in his chosen profession; he’s taught his daughter, Kortlyn, the art of forging and has trained countless others how to weld. “Blacksmithing is the world’s second oldest profession,” he says with a friendly, casual reverence. With passionate teachers like Kevin, it’s clear the tradition is in good hands. To give this steel screen door its rich copper patina, Kevin gave the metal a faux finish using five colors of paint. Every detail, from the trees to the bears is hand cut, not computer generated. 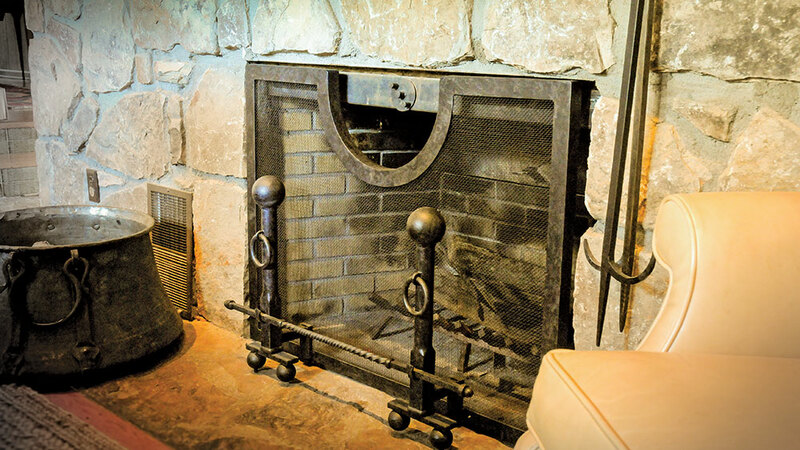 The ingenious design of this hand-forged steel fireplace screen features a U-shaped cutout, allowing you to stoke the fire without moving the screen. The andirons are integral and act as the feet for the screen, while a heavy woven mesh stops flying embers in their tracks. Kevin also forged the pokers by hand. 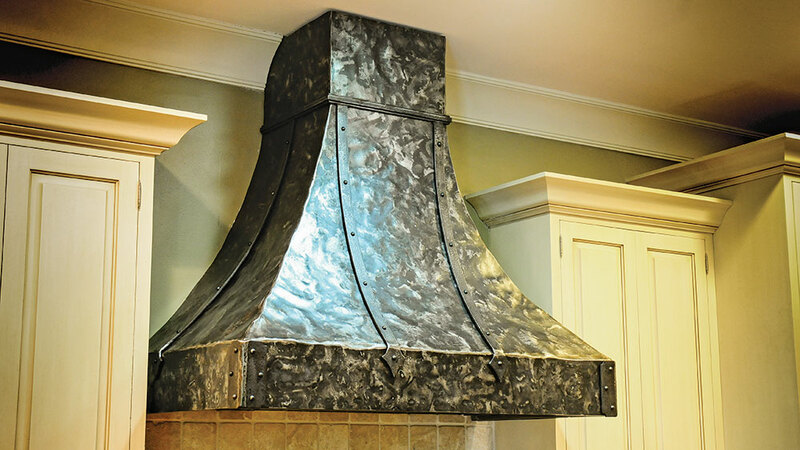 To give this new vent hood an antique look, Kevin burnt sheet metal with a torch, hand-hammered it, flattened it out and polished the highlights. The unit is 48 inches wide by 55 inches high. 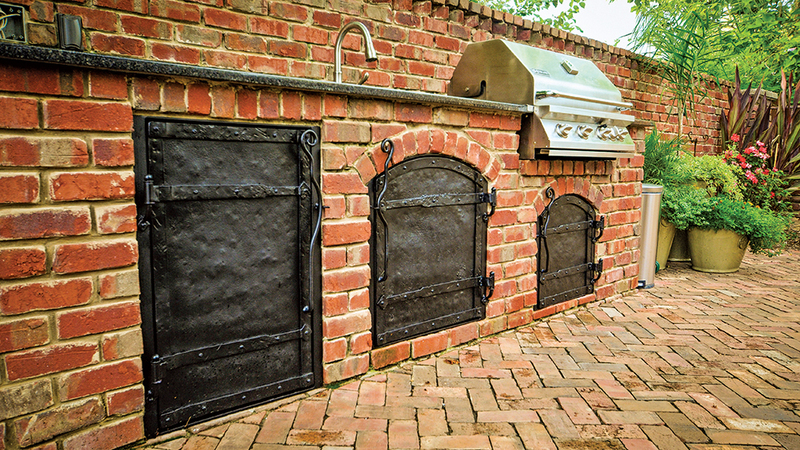 These beautiful steel doors conceal the outdoor kitchen’s refrigerator, propane tank and water heater. To give the raw metal its aged appearance, Kevin says he painted it with “lousy cheap paint,” put rock salt on it for a week to weather it, hosed it off and repeated the process several times. 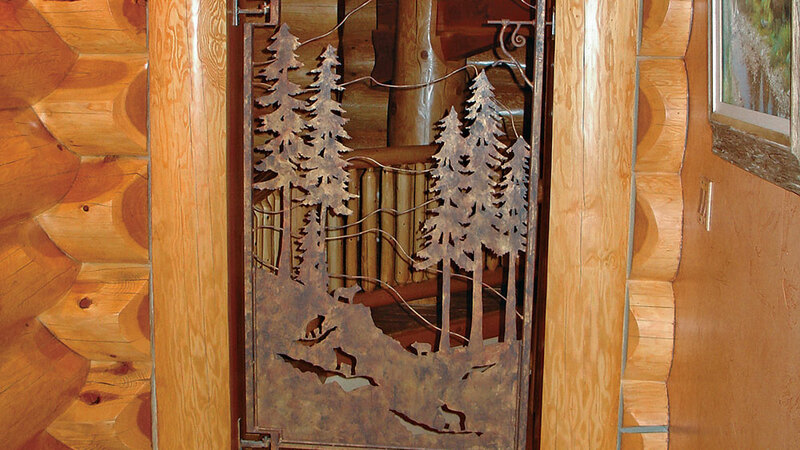 Many of his designs can be replicated in copper, iron or other metals. 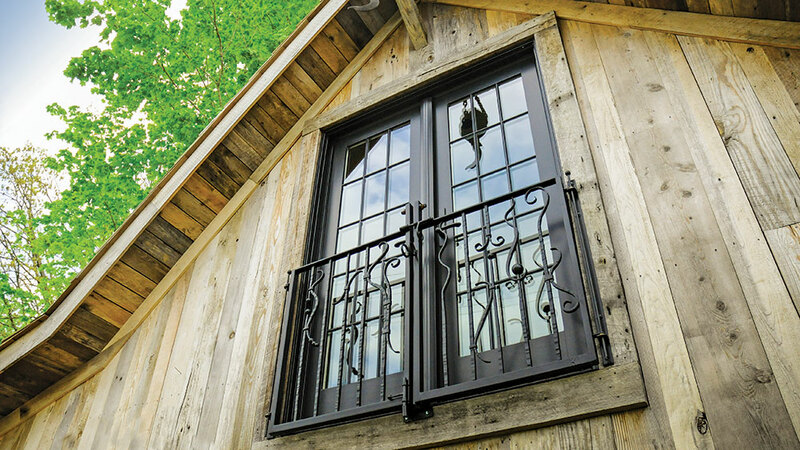 To commission a piece of ironwork for your own log home, contact Kevin Johnson at 865-531-3707, contact@theironstudio.com or visit his website at theironstudio.com.